Low On World Cafe : World Cafe Indie rock's slowcore pioneers perform songs from their latest album, C'mon. Since 1993, Low has captivated audiences worldwide with their austere, melancholy, and totally singular sound. 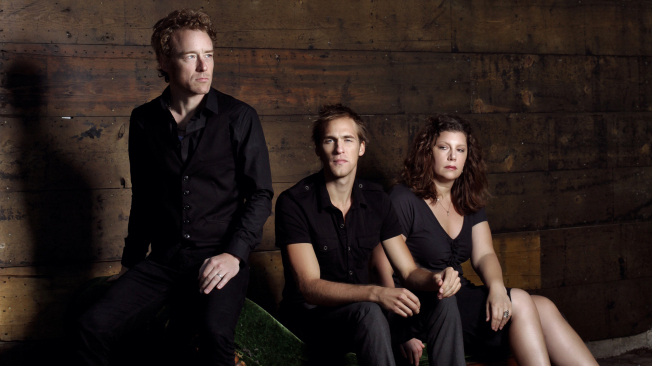 Pioneers of the slowcore movement in indie rock, Low countered the sound and fury of grunge with quiet, minimal arrangements centered on the vocal harmonies of husband-and-wife duo Alan Sparhawk (guitar) and Mimi Parker (drums). Low's ninth studio album, C'mon, released earlier this year, is the product of a creative journey that took the band from a former Catholic church in Duluth, Minn. (Sacred Heart Studios, where the album was recorded) to the sunny streets of Los Angeles, where the band enlisted the services of co-producer Matt Buckley, better known for his work with pop artists like Katy Perry and Avril Lavigne — an odd choice, but evidently the kind of creative curveball the band needed to stay on top of its game. C'mon is hardly upbeat, but it nevertheless contains some of Low's most optimistic and accessible work to date. Currently touring Europe and North America, Low stopped by the WXPN studios to perform songs from C'mon and discuss its recording process.